7. Here, cramped between decks, live the crew of HMS Indomitable, many of them pressed into service against their will, and all bound by the Royal Navy's iron discipline. The innocent and handsome Billy Budd, however, enjoys naval life. Claggart the evil master-at-arms, loathes such cheerful innocence and, setting out to entrap and ruin the young sailor, accuses him of mutiny. From this false charge springs a naval tragedy. 1. A HANDSOME SAILOR. When a press-gang from the navel vessel HMS Indomitable intercepts the merchant ship Rights-of-Man looking to recruit sailors, they find a prize in Billy Bud, a youthful seaman. Billy's shipmaster, captain Graveling, begs lieutenant Ratcliffe of the warship to leave the boy, but Ratcliffe will not be dissuaded and Billy is willingly taken away. On leaving the Rights-of-Man, he bids the ship farewell, surprisingly the officers of the Indomitable think he is being sarcastic. This is not the case, however, for Billy has an innocent, open nature. 2. AN OFFICER'S DISLIKE Several mutinies disturb the navy in the summer of 1797, but Captain Vere, a man of noble birth and esteemed for his naval abilities aboard the Indomitable, is not over-worried. Billy, too, is happy with life on the warship and is keen to please, especially after he witnesses a flogging. He does, however, get into trouble for small faults, such as stowing his bag wrongly. This worries him because he is conscientious boy and takes his failings seriously. Billy talks to a Danish man, the Dansker, who tells him that John Claggart, the master-at-arms, is 'down' on him. The boy does not believe this because Claggart is so pleasant to him, soon after, when Billy spills some soup on the deck near Claggart, the non-commissioned officer jokes about it, confirming Billy's view. In fact, Claggart has taken a violent dislike to Billy Budd. 3. CLAGGART'S BLACK SOUL Claggart's hatred of Billy springs from his envy of the boy's youth, good looks and innocence. The master-at-arms assumes that Billy returns his hatred and tells one of his underlings to gather, or fabricate, information against the boy. 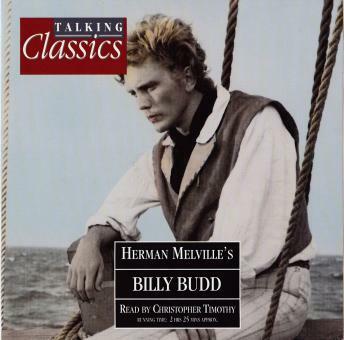 On deck, a few nights later, Billy is woken by an unknown sailor who tries to bribe him to join a mutiny. Billy indignantly scorns the idea but is upset by the offer. He tells the Dansker, who again says that Claggart is against him. Billy, in his innocence, rejects this idea. 4. FALSE ACCUSATION. Billy forgets his worries while busy with daily life at sea. Claggart also seems to smile on him. However, the man is merely biding his time until one day, after an encounter with the enemy, he approaches Captain Vere with damning news. The Captain, who instinctively dislikes Claggart, is annoyed by his comparison of the Indomitable with another ship involved in a recent mutiny, he is also astonished when Claggart claims that Billy is a mutineer. Claggart insists that the boy's innocence is false. 5. MURDEROUS INNOCENCE. Vere, recalling his favourable impressions of Billy, decides to see him and Claggart privately in his cabin. Billy is surprised but not worried to find himself with the two officers, until he is accused of mutiny. Then he is dumbfounded. Vere, observing Billy, guesses that boy is struggling to overcome a stutter and is suffused with anger. He tells Billy not to rush with an explanation, but the boy, unable to speak, lashes out and accidentally hits and kills Claggart. Vere calls for the surgeon who confirms that Claggart is dead. The Captain then orders an improvised court martial to try Billy for murder. 6. THE TRIAL. Vere is worried that if he delays the trial, rumour of Claggart's death and the boy's imprisonment may stir up mutiny. He decides to proceed at once, although it would be more correct to wait until returning to the squadron. During the trial, Vere acts as witness, with his most senior officers as judges. Billy explains that he hit Claggart because he could not speak to defend himself, and that he cannot imagine why Claggart should hate him. He also declares that he is loyal to the captain, and Vere believes him. The officers are uncertain of what to do, until Vere reminds them of their duty and they find Billy guilty. He is sentenced to hang at dawn. 7. DEATH AT DAYBREAK. Vere informs Billy of his fate. The First Lieutenant is stuck by his Captain's expression of grief on leaving the lad. The crew is stunned by the news. Claggart is buried with full honours, while the Chaplain goes to preach to Billy. The first time he finds Billy asleep, the second, he finds him so unafraid that he abandons sermonizing, and kisses him farewell. At daybreak, the crew gathers and Billy is taken out. His last words are 'God bless Captain Vere', which the crew echo. As his body hangs from the mast, it seems transfigured by the sun's rays. 8. THE LEGACY OF BILLY BUDD. The lack of the normal convulsions during hanging perplexes onlookers then and later, and the surgeon can offer no explanation. As Billy's corpse in a weighted hammock falls into the water, sea birds appear and circle the spot, as if in homage. Soon after, the Indomitable attacks a French ship and Captain Vere is mortally wounded. He dies murmuring, 'Billy Budd'. The official notice casts Billy as a mutineer who stabbed Claggart. But the crew regard the spar from which Billy was hanged as a holy relic and a ballad is written - Billy in the Manacles.